Welcome to our Online Patient Center! Here you can get information about what to expect during your visit with as well as important forms you can complete before your appointment to save time. First Visit? Submit Your Paperwork Online! This information lets us know the history and current state of your health and your eyes. Because vision is closely tied to your general health and your family’s health you will find questions pertaining to items they may not seem directly related to your vision. The child form is appropriate for patients ages 0-13. Participating in our free Infant Vision Screening? It can be a challenge to fill out paperwork with an infant in tow! Use our online form to make your visit a breeze. If you are unfamiliar with our Infant Screening program and would like more information, contact us today! Have your previous eye exam records sent to us! Coming to our office for the first time? It can be helpful for you and your new doctor to review your previous eye exam records to make your visit easier and more enjoyable. Fill out the following form and return it to us. We need the name and the phone number or address of your previous eye doctor. We will take care of everything else on your behalf! Why do so many people skip their annual eye exam? We believe it’s because they don’t know what to expect. Here we will outline the process so you can feel comfortable knowing there is nothing to worry about. Upon your arrival, our staff will ask you to complete a few forms. If you prefer to complete them in the comfort of your own home, you may download the PDF or submit your information online. This paperwork provides us with your health history and other information related to providing you with the best eye care. To help relieve any concerns or fears you may have about your visit, our friendly and knowledgeable optometric assistants have answered some of the most common eye exam questions for you. Read More. It is our commitment at Visionary Eye Care to be honest and straight-forward regarding the cost of our eye care services. We believe that the cost for great eye care shouldn’t be a secret. If you have any questions specific to your insurance or needs please call or email us at any time. 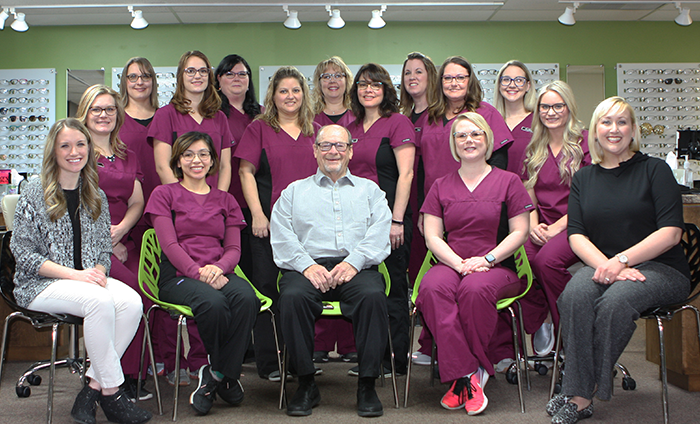 Our friendly billing and scheduling staff is waiting to help you! It is important to know that many problems involving the eyes and vision can or must be submitted through medical insurance. We accept a wide range of medical insurance to accommodate these needs including Medicare, Blue Cross Blue Shield, Sanford, Medica, Cigna, Aetna, United Healthcare and many others. Since there are so many plans and coverage varies widely, please call us to find out if your plan(s) covers care in our office. Our staff will verify and explain your benefits during your visit at no charge. During you eye exam we will also discuss the cost for any additional services your doctor may feel are necessary to keep your eyes healthy and protected. Prior to ordering eyeglasses or contact lenses our staff will provide you with an accurate out-of-pocket estimate so you can place your order with confidence. Remember, we are committed to being honest and straight-forward regarding costs! We offer a special type of eye examination for patients who are concerned about cost and/or do not qualify for other types of services. Our wellness exam is appropriate for patients who do not have medical conditions affecting their eyes and for those who are not experiencing any problems with their eyesight. A wellness exam is less detailed than a comprehensive exam but includes measuring your eyeglass prescription and a basic eye health exam. It does not include services for contact lens prescriptions (please see below). It may be appropriate if you are simply looking to update your eyeglass prescription. The cost of a wellness exam is $144. You may need to discuss if a wellness exam is appropriate for you upon scheduling or upon arrival for your visit as this less comprehensive type of exam is not appropriate for all patients. Additional fees for contact lens evaluations are charged separately and range from $60-221 depending on your needs, experience with contacts, the complexity of the prescription and the contact lens type. For a vast majority of patients already successfully wearing contacts, the fee is an additional $60. For most patients wanting to try contact lenses for the first time, the fee ranges between $87-169. The contact lens examination is separate because your eye doctor is required by law to determine if your contacts are safe, healthy, comfortable and providing adequate vision. This additional requirement is needed every 12 months to maintain a valid prescription for contact lenses. Have a valid contact lens prescription? Call us at 701-483-9141 to order your lenses or order online. All of the above plans can be used for eye care needs including exams, eyeglasses, prescription sunglasses, reading glasses, safety eyewear, contact lenses and related supplies, ocular nutrition supplements, routine office visits and medical visits. If you have no insurance or other vision benefits there are still many ways for you to receive the care you need. We accept cash, check (local only), credit and debit cards (Visa, Mastercard and Discover). Care Credit is also available to use in our office. Learn more about Care Credit here.